This is an “anti-rating”: being the first on this list is bad. 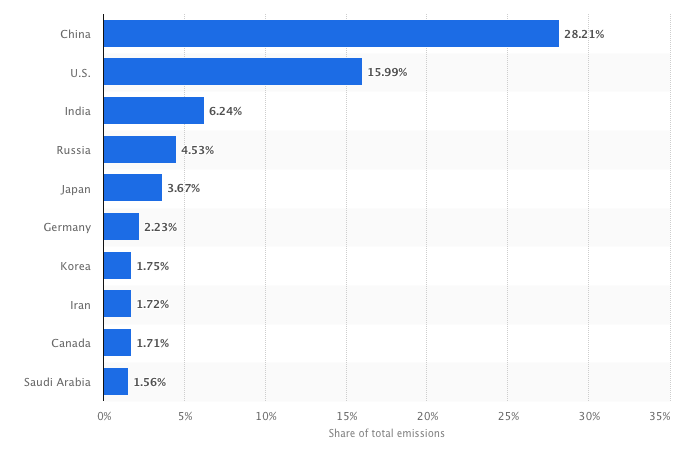 These are the top 10 producers of CO2 emissions worldwide in 2016 (likely, 2017 as well), based on their share of global CO2 emissions. C’mon, China-US-India-Russia-Japan, control your emission! This entry was posted in Analytics, data analytics, big data, big data analytics, data on the internet, data analytics meaning, Data Analysis and Visualization, Editorials, Research, Top 10, Top 20, Top 50, Top 100 and tagged global CO2 emission, global CO2 pollution, top 10 countries. Bookmark the permalink.